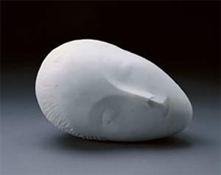 Born in a small Romanian village in 1876, Constantin Brancusi (more) reached Paris at age 30 already developed as an artist. Soon enveloped in the new art movements, he would emerge as the the world's foremost founder of modern abstract sculpture. 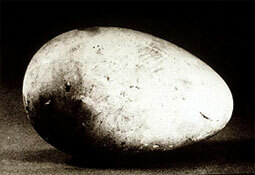 But as significant as is his impact on world art, intriguing is the source of his inspiration. 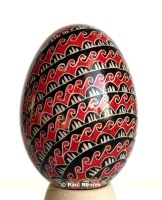 It is rightfully argued that he tapped his village roots as a source of ideas ... but one can go further back in time and see strong links to art-forms that originated in early European civilization as far back as twenty millennia including the Danubian Basin area where he was raised. Put yourself to a simple visual test (right) and see if you can identify Brancusi's work from ones dating up to twenty millennia earlier (see answer below). It's hard to know who did which. 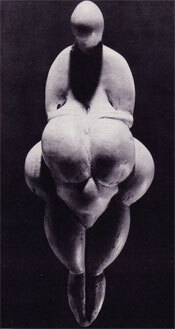 Ancient art was 'modern' indeed. Consider, too, his famed "Column of the Infinite" or "Endless Column" created to memorialize Romanian soldiers who died in World War I. The column stands in Targiu Jiu, a southern town in the Wallachian region. While various explanations are offered for the symmetrical form chosen, a plausible one from ancient times is the use of two triangles forming an hour-glass shape. One part symbolizes birth to maturity; the other maturity to death. Repeating the sequence, as Brancusi did, depicts the infinite cycle of life. The symbol is widely seen in artifacts recovered from sites along the Danube (but was also widely used in other regions of the world). U.S. 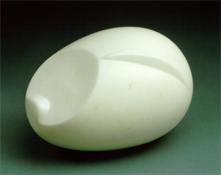 MUSEUMS with important Brancusi collections"
"The Goddess, whose body is an hourglass, is encapsulated within a seedlike compartment that is surrounded by water meanders," writes Gimbutas. "In other words, represented here is the Goddess about to be reborn from the waters." Below is another depiction. "The hour-glass form symbolizes the subterranean or subaqueous life force of the Goddess and imminent rebirth ," suggests Gimbutas. [The artifacts on the right are dated to 4000 B.C., Cucuteni Era in Romania in The Language of the Goddess, by M. Gimbutas, Harper & Row, 1989]. Though speculative, such connections under-score a unique quality of Romanian culture: living links between the present and its ancient past. "A survey of 500 British artists, curators, critics and art dealers asked each to name the world's most influential piece of modern art." Brancusi's "Endless Column" was among the top ten.